At St. Joseph of Arimathea this Sunday we will have a somewhat different service as we observe the tenth anniversary of September 11th. Along with almost everyone I’ve talked to, I find it hard to believe that ten years have passed since that day. And yet, much has happened since then in my life and in the lives of so many people. Our nation is certainly in a different place. And because so much has happened, and so much that has happened has been affected by the events of those days, it is appropriate to observe the anniversary. Additionally, there is something particularly powerful about the passage of a decade, and the call to look back over what has happened during those interveneing years. As part of our observance of the day, for the liturgy geeks among us, we will begin with the Penitential Order & Decalogue at both services (8 AM Rite I and 10:30 Rite II). The purpose of this, with its movement of the confession to the beginning of the service (which I ordinarily dislike) is that it will both set the tone for the service as one of remembrance and reflection, as well as provide a more distinct opportunity for the Prayers of the People to be a focal point during that portion of the service. 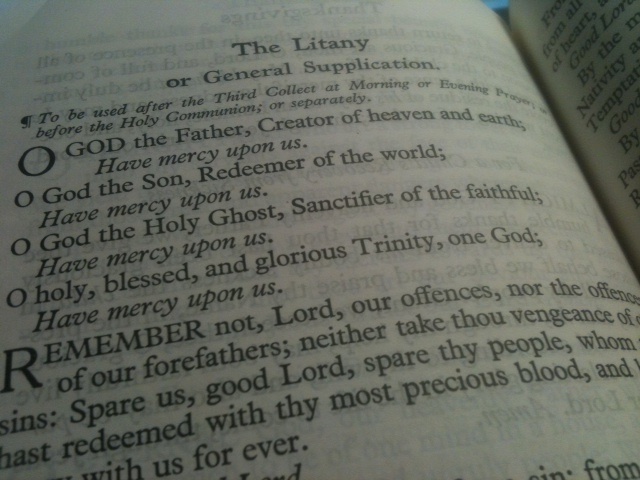 In the place of our normal prayers we will have a litany written for the occasion. I couldn’t find one that I liked completely, so I took inspiration from several. Primarily from the Great Litany in the Book of Common Prayer and from this version authored by another Episcopal Priest (also, you’ll note, inspired by the Great Litany). The version I’ve compiled/authored is below and I would be interested in any constructive criticism that might aid in its improvement before Sunday. People Have mercy upon us. Have mercy and hear the prayers and supplications of your people, O Lord, who are called by your name. For all who died in the attacks of September 11th 2001, that they be granted continual growth in your love and service and rejoice in the fellowship of all your saints. For all who have given their lives since that day. For those who answered the call of their country, venturing much for the cause of freedom and defense, giving of themselves for the benefit of their neighbors. For all who grieve the death of mothers, fathers, sisters, brothers, friends, and fellow citizens; remember them in your mercy, grant them a sense of your abiding love, comfort them in your goodness, lift up your countenance upon them, and give them peace. Turning all hearts to you, enable us to stand reconciled before you. R. it is he who shall keep you safe. R. to keep you in all your ways. R. and save us from this generation for ever. R. from where is my help to come?